Just a step to the north of the Place des Vosges, on a quiet picturesque street, this building dates from around 1750. The Marais is our favourite quartier . Much of the area dates from the 16th and 17thC, featuring narrow streets, fine architecture, boutiques, antique shops, restaurants, cafés. Strict building laws protect its authenticity. This is where Parisians chose to wander on weekends ! The centrepiece is, of course, the Place des Vosges, the purest example of 17thC architecture, its arcaded façade set around a central park with trees and benches - great for a picnic lunch ! 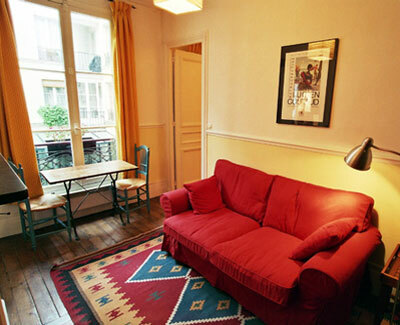 Easy walking distance to the Picasso and Carnavalet Museums, Bastille Opera, Ile St Louis, Notre Dame, Ile de la Cité and much more ! Just 5 mins walk on the rue St Antoine you will the best specialist food shops (baker, deli, cheese, fish, wine ...) . in the very best French tradition as well as an excellent supermarket. Just a step to the north of the Place des Vosges, on a quiet picturesque street, this building dates from around 1750. Set around an enchanting wide cobbled courtyard with a central flower-filled fountain and various tubs of shrubs. Our first floor apartment is light and sunny overlooking the courtyard. Both building and stairwell, in true Parisian tradition, could do with a coat of paint which they will get ... some day ! This is a pretty apartment which has been totally renovated in 2002 to make maximum advantage of its 31m2. It features tall windows, old wood floors polished with bright rugs, sunny yellow colour scheme, nice country antiques. A romantic spot for lovers of Paris, or just plain lovers . . . Entrance leads to small Living room with comfortable sofa, bistrot dining table, Cable TV, radio/cassette player, and archway to new well-equipped Kitchen overlooking the courtyard, tiled work top, washing machine, 4 hobs, microwave. Off the kitchen is a new tiny Shower room with WC. Beyond the sitting room is the Bedroom with twin beds (can make wide double). Hair dryer. Electric radiators. Initial linen supplied. Local line telephone.